This campaign has been the best to date. Level Playing Field (LPF) has never had so many clubs, disabled supporters associations (DSAs), fans and other organisations take part. The planning for Weeks of Action 2019 started in April 2018. Year on year since the campaign started it has always got bigger and better and the challenge this year was to overtake last year’s achievements. The message of the campaign has never deviated and Weeks of Action is here to showcase good access and inclusion for disabled fans and to celebrate what’s done well. It aims to drive greater standards of inclusion whilst also highlighting that watching sport is a positive activity for everyone, and to encourage anyone who doesn’t go but may like to. Every year there has been a specific theme for Weeks of Action however, responding to feedback on previous campaigns, LPF decided to leave the theme open and broad with one key message of celebrating good access and inclusion. In February LPF teamed up with Rotherham United Football Club and their DSA to launch this year’s campaign. To mark the occasion a video was created to highlight the importance of good access and inclusion and how Weeks of Action can be used to achieve this. 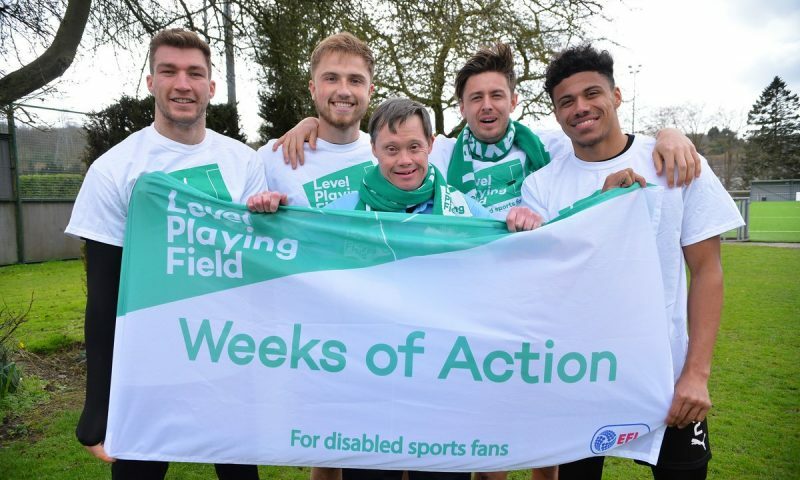 LPF staff, Trustees and Ambassadors visited over 25 different Weeks of Action activities and football matches across England and Wales, from Premier League to National League and everything in between. The opportunity to support the innovative and engaging activities clubs DSAs and fans have put on is really important. Preston North End, provided multiple opportunities for their young disabled fans to take part in work experience at Deepdale. Fans could support the ticket office staff or the groundsman in getting the hallowed turf ready for matchday. Have a look at their video here. Wolverhampton Wanderers, took part with multiple activities for Weeks of Actions. The players were raising awareness by warming up in in Level Playing Field’s new campaign T-shirts with the stand out moment coming from Jack Smith who announced the team on his new ‘Black Country accent’ voice assisted technology. This would later be shown on the ‘BBC One Show’ you can read more here. LDSA (Liverpool FC), partnered with charity ‘Cycling Projects’ who provide accessible cycles for disabled people. The DSAs aim was to provide opportunities for their DSA members to take part in physical activity. LDSA Chair said “It’s an honour for LDSA to take part in Weeks of Action 2019”. You can catch up more on the event by clicking here. AccessiBlus (Birmingham City) and AVDSA (Aston Villa), Ahead of the 127th derby both DSAs caught up to discuss the game ahead and how to bring about a better matchday experience for fellow disabled fans, to read this inciteful interview click here. Rainbow Group -Walsall FC Looked to provide opportunities for young disabled children and their families in the local community to attend their first ever game. One new fan said “I’m nervous to see the game but I’m looking forward to seeing a lot of tackling and I’m hoping to see a goal”. To read more about their first ever matchday experience click here. Morgan Parry has a target of visiting all 92 league grounds and only has a handful left. He has been representing LPF at matches as he visits these grounds over the Weeks of Action period. To read an interview with Morgan click here. Kieran Reynolds is a passionate Newcastle United fan and also supports is local club playing in the National League, Sutton United. He wrote a blog, Football, Asperger’s and Me. It’s a fantastic insight, click here to read the article. There has been so much activity in this year’s Weeks of Action and trying showcase everything would be challenging! However, you can read up on more activity by visiting our news page, please click here. Plans for next year have already started and looking at ways that we can build on what has been an extremely successful campaign are well under way. Packs will be sent out at the start of the 2019/20 season to allow clubs, DSAs and fans to plan their events to maximise their impact foe Weeks of Action 2020! Owain Davies , LPF Chief Executive said : “This year we had a huge amount of support and we would like to thank everyone who took part. This wouldn’t be possible without the ongoing support from the Premier Leagues Fans Fund and the EFL in supporting the campaign. As a football and sporting community we are shining a light on what’s good about the ‘beautiful game’ from and access and inclusion perspective and we all want to see this grow and develop with more fans attending matches and having a great experience. As we look back on what’s been a fantastic campaign we hope that there is a strong legacy left and the positive work continues throughout the rest of this season and for future seasons.